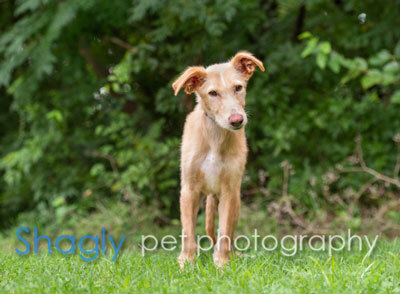 Murphy is an approximately 5-6 month old male red fawn puppy. He was found as a stray by Midland Animal Control. When Murphy arrived, his back legs were not straight. X-rays were taken which showed no abnormalities. Now, after receiving the results of his DNA test, it is all clear. 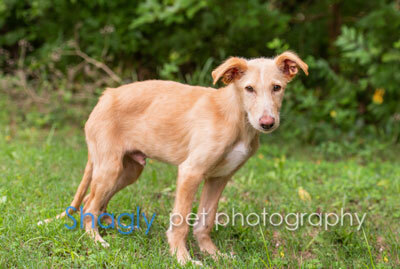 Murphy is a German Shepherd and German Shepherd mix (of course we know there is a greyhound in there somewhere)! He is a very,very good boy and he loves to “sit” for you . Murphy appears to be cat tolerant at this time. Murphy has a very chill disposition. You can pick him up and hold him and he doesn't seem to mind. He walks on a leash very casually and will most often sit when the leash holder stops walking. He enjoys the company of people and likes to be near them at all times. He is currently staying with two other greyhounds and a cat. He is a very curious little guy and likes to go exploring. He doesn't seem to like to sleep on a dog bed, but does have his favorite spots in the living room and bedroom where he can always be found. Murphy barks more than the typical greyhound. He is an excellent alarm for the front door, landscapers, and passersby. He is a very quick learner and already knows "sit", "come", "no bite" (to stop mouthing), "down", and we're working on "leave it". With some formal training, there's no limit to what this little smartie can learn. Murphy enjoys belly rubs, squeeky toys, neck scratches, ear scratches, playing in puddles, and laying in the dirt. From the size of his paws, this little guy may be quite big when all done growing. His nicknames are: McMurphy, Little Dude, and Fuzzy Face.